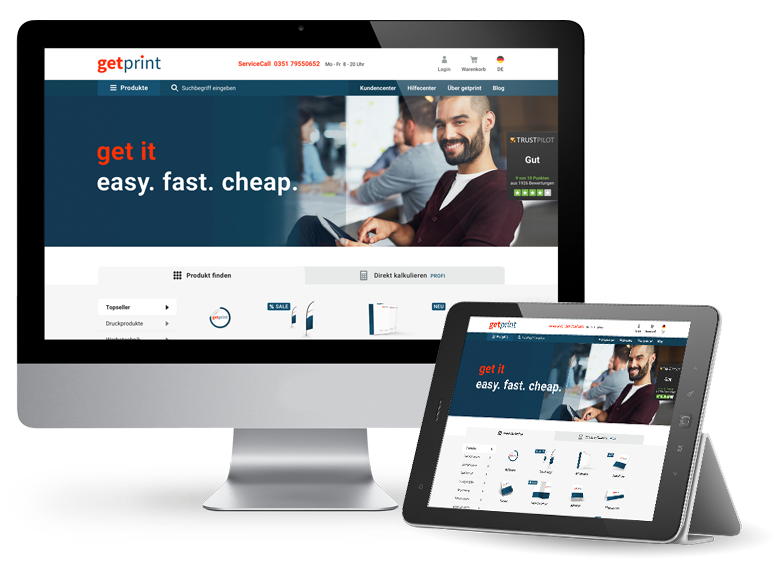 “Get easy – get fast – get cheap”: getprint is a B2B online printing shop there to process simple, fast and inexpensive orders. The portal focuses on the European regions of Hamburg, Marseille, Manchester, Milan, Barcelona, Graz and Geneva within a 250 km radius. These are known for a distinct cultural and creative scene. A local contact person is available specifically for our customers to advise and help on site if required..
With its full range of printing products, promotional items and much more, getprint is ideal for agencies and resellers in particular. The fair and transparent order prices can be calculated online. Tailored help is also available on request via ServiceCallBack and ServiceChat. Office supplies, advertising equipment, etc.